How do Atheists respond when they finally understand multiple realities coexist? Dr. Reagan: Have you had a personal opportunity to share some of the arguments for the existence of God with Atheists and Agnostics and see how they respond? 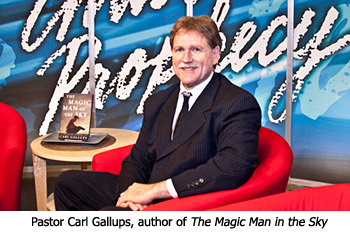 Carl Gallups: For years before I wrote my book The Magic Man in the Sky, and that is why I finally wrote the book. Carl Gallups: When they're honest, and when we have decent conversations, its pretty mind blowing to them. In fact, we have led many to the Lord and a saving relationship with Him with the argument that multiple realities coexist and yet be unaware of each other. That is one of the exciting things about Internet technology and Internet ministry now, it's that you can reach out to the world and can minister to people in a way that's a little less intimidating, a little less threatening, because you can do it by email or in blogs. Every week people come out of Atheism and they come out of this evolutionistic philosophy of life and come to Jesus Christ. Dr. Reagan: In fact, you have some testimonies don't you about the impact of your book upon Atheists and Agnostics demonstrating how some people are just totally confused and don't know what they believe? Carl Gallups: Yes, comments began pouring in about this antidotal understandings of how God exists, and He's using the book. I'm simply overwhelmed, and I just give Him all the praise in full. Dr. Reagan: Your book is written in such a way that it is easy to understand. Wouldn't you say so, Nathan, that it just flows and it's easy to understand? Nathan Jones: Yes, I agree that in reading it flowed very well. Dr. Reagan: You don't have to be a physicist or a scientist or whatever. The arguments are so logical, and that's the point. People can't think of a way to refute them. Nathan Jones: I like that you start your book with a story where in the beginning a Christian and a non-Christian — Christopher and Crowley — have a conversation about faith, and how the non-Christian just blows the Christian out of the water. To me, that story connected me to the book right there because I recognized all those arguments used to undermine the Christian's faith. Then you answer all of those arguments. So, it's rather like a self-help tool for any Christian who wants to understand their faith and why they believe what they believe. Carl Gallups: Thank you, I appreciate that. I wrote the book and the first chapter, but originally I didn't have the opening conversation between Christopher and Crowley. I didn't think to put that in there at first. Everything after that I had written, but then adding the conversation just was from God. It was just this sort of inspiration afterwards to start the book with a fictitious conversation between a Christian and an Atheist, and let the Atheist dump all of his arguments and destroy the Christian. In the first chapter, that's what finally happens. Dr. Reagan: I first thought, "Man, I don't like this story." But, it drew me to keep on reading. Carl Gallups: It's meant to draw you in, because if you're a Christian you're thinking, "How does the author get out of this predicament? I wonder what kind of arguments could be made to get out of all of the Atheist's arguments. I wonder how the Christian deals with this." And, if you're an Atheist your thinking at the start, "Hey, I like this book!" So, the conversation served its purpose and God has blessed it. I think it was an inspiration inspired by God to put that first chapter in there. Dr. Reagan: Now you're writing another book right now, aren't you? Carl Gallups: I am. I'm not allowed to give the title out yet, but I can tell you that it is a juxtaposition of biblical truths versus political agendas and cultural myths. In other words, I just take topics from the world today such as homosexual marriage, abortion, Evolution being "settled science," gun control, and all of these things that impact our lives and the decisions that we make. Legislatures are making laws and world government are dealing with all of these challenges. So, I take every one of those and I compare them to God's Word. What does God's Word really say? What would Jesus say? What would Jesus do? What's the truth? Is there an agenda here? How do these things tie together? What's the spiritual agenda? I tie all of these together as the subject of my next book. By the way, Christopher and Crowley are going to show back up in this book. In the sixth segment of our interview with Pastor Carl Gallups concerning the existence of God, he'll give us the greatest non-biblical proof for God's existence. I don't want to wait until Monday. How can I get a hold of Carl's 'greatest non-biblical proof for God's existence.'? Hey nathan , get ready to take off on sunday august 4 2013. Masters of illuminati , located in london, are planning hell of attack on U.S targets nationwide and worldwide.They will also attempt to assisinate an important politician in the middle-east. Holocost and what they would have done and the moral issues involved and then uses the same questions and how they responded to talk about abortion. It is amazing and so many people changed their minds about pro-choice because of how he explained everything? It is amazing. Don't want to promote another web site but try to see it could help so many to understand. Iam dealing with an atheist that is involved with a family member and would love to know how to bring him to God. Thanks will try to get this book soon. I don't believer any of this "terrorist threat" propoganda being thrown out there. Yes, islamic terrorist are there and they are a threat, but I think this latest "hype" is a (to use a Star Wars reference) phantom meance. The agenda behind the phantom menace is so the government can continue it's massive data collection while trying to turn the public back to supporting it. We conservative bought into the Patriot Act (I know I did at least) but that was before I knew Big Brother was collecting data on ALL of us. I was led to believe it was just on suspected terrorists. The big lie is they need to track us all. In reality all they need to do is track the phone numbers of the terrorists! See who they are calling. Why do it in reverse? Many people believe America's anti-christ (Obama) will find someway to become a dictator before his term is over. I'm becoming a FORMER doubter of that theory. Anon 1 agree with you 110% it isn't even funny what our gov is doing to regular folks as someone likes to say.